I have said it once and I will say it again, soup is the ultimate comfort food for me. This soup fits that comforting qualities with hearty veggies and pasta/beans in a flavorful broth. This soup is great on a cold night in or serve to a crowd. It can be switched up with the different kinds of pastas you use and served with your favorite bread. Topped with some vegan parmesan cheese and call the troops for dinner and watch the pot disappear. Heat a deep pot over medium high heat and add oil and vegan bacon, brown the bits lightly. Add thyme, parsley, bay leaf, red pepper flakes, chopped carrots, onions, celery, and garlic. Season vegetables with salt and pepper to and cook for 5 minutes. After, Add beans, tomato sauce, and stock & vegan pork powder/paste to pot and raise heat to high, bring soup to a boil and cook until vegetables are tender. Remove thyme stems and bay leaves from soup and Add cooked pasta. Reduce heat to medium, Add spinach and cook in soup, stirring occasionally, 5 minutes or until spinach is cooked. Taste for salt & pepper and season to taste, if desired. Let soup rest and begin to cool for a few minutes. 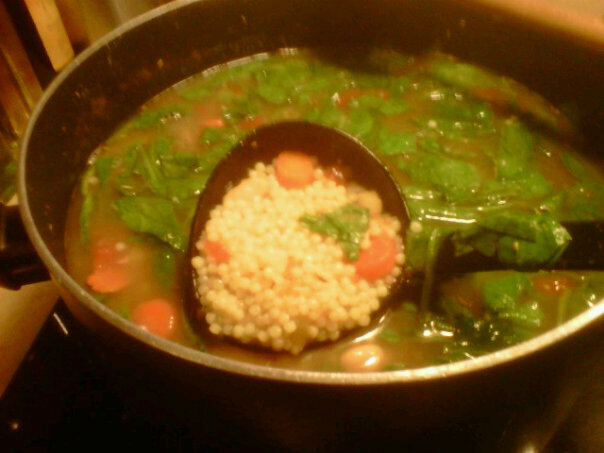 Ladle soup into bowls and top with vegan parmesan cheese and serve with crusty bread on the side. Enjoy!